I have no connection or agreement with the seller. No warranty of any kind is expressed or implied. Thats a nice, very original looking loop. 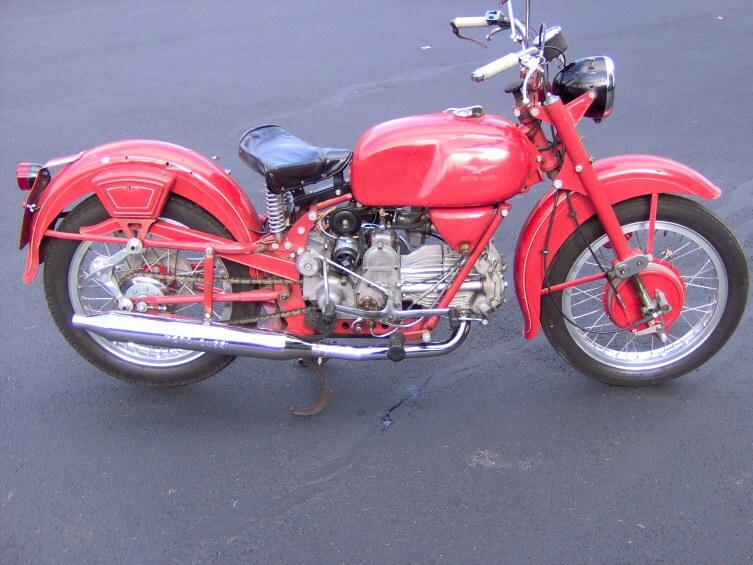 The description is a little weird, or inaccurate,though..
"The bike features a red and white paint scheme over fiberglass side covers and an aluminum fuel tank, the latter of which is noted as discolored." The battery covers could possibly be fiberglass reproductions, but someone would have had to open up all of the "grills" which are closed on those. Aluminum tank? Don't all of us Loopers wish... Edit: just looked at the "full sized" photos: battery covers are definitely not fiberglass. Plus, I'm just going to say it: chrome bores. Really nice looking bike. I'm not familiar with the BAT website. Wish it was closer to go take a look. There is just nothing as cool as a 2-tone Eldo like that with Wixom bags. The lines are so elegant. My very first Guzzi looked exactly like this one, with about the same mileage, that I bought from a collector who had it stored in the basement of a house I was renting in St. Louis. "Stored" isn't really the word, it was sharing space, un-restored, un-preserved, with about a dozen other weird euro bikes. 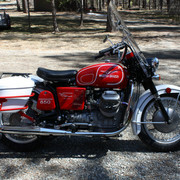 I had never seen a Guzzi before, and I was smitten. Bought it, got it running (fresh gas and oil, carb cleaner sprayed into the carbs after removing the float bowls), moved to Lompoc, CA, and drove down to Guzzi Classics and bought a set of white Wixoms from Mark. I drove that rascal for a few years back and forth from Lompoc to Goleta, never even HEARD of the chrome bore problem, purred like a kitten. Ignorance really is bliss. There is a current thread about what you wished you'd never sold; this is one on my long list. This one is just over $4000, with three days to go. My bet is that it will top $7500. I never cared for the red and white paint scheme until I bought one. Much better looking in person. Funny how the sidecover is not matching the tank. Seller says it's all original paint, though. Just hit $5000. with 2 days left. Ad says fiberglass side covers. Aftermarket? I think the ad is in error. The fiberglass ones don't have open "grills" and these do, plus it looks like there's some rust on one of them. $5985 with buyers fee. Well bought. IMO, that's fair market value for one in that condition. Not a bad deal, but not a great one either. I guess I should assemble my '72. Gilardoni cylinders and new paint. Prices being where they're at. Agreed. I didn’t see anything really special about this one. 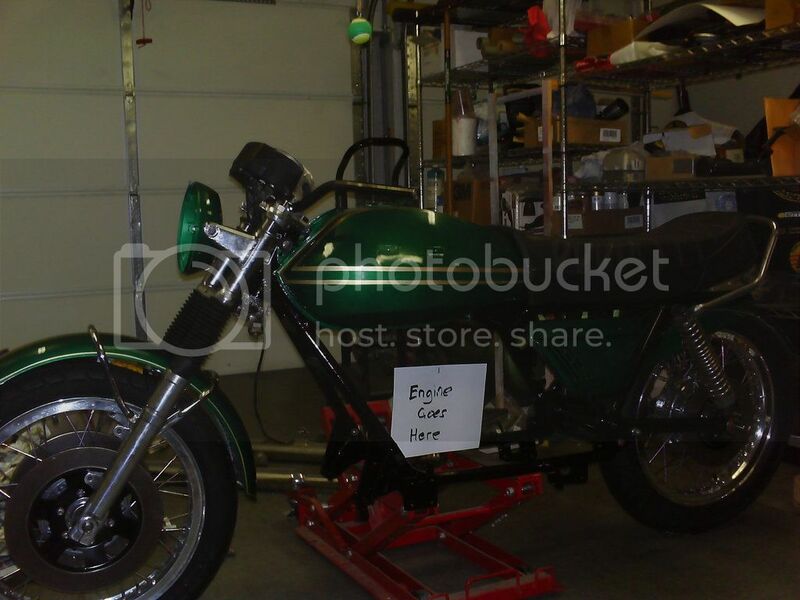 Good presentation by the seller though.